Services - STARWOOD EQUINE VETERINARY SERVICES, INC.
Acupuncture is an integrative veterinary medical therapy that works by stimulating predetermined points, acupoints, to generate a physiological response. Acupoints have been shown to have a high density of free nerve endings, small blood vessels, mast cells and lymphatic vessels, which aid in generating a therapeutic response. Acupuncture can aid in controlling pain and muscle spasm, as well as promoting vasodilation and neuronal regeneration. Methods of acupuncture stimulation include dry needling, electroacupuncture, aquapuncture and hemoacupuncture. Frequency of treatment and method of stimulation is dictated by the patient and their specific condition. Ideal for those clients who are new to horses or would like to have a thorough checkup of their equine athlete. 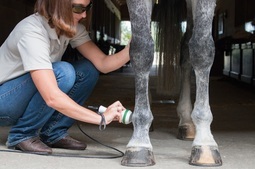 Starwood Equine is offering a comprehensive management exam to assess diet, shoeing, special needs, and general management to improve the health of your horse. The focus is disease prevention, improving health and detecting unrecognized health problems. Although a review of pre-existing and new issues are part of this exam, the scope of this program is to take a more comprehensive look at the whole picture. Ultimately, your Starwood veterinarian will base any management recommendations for your horse on the exam findings and lifestyle evaluation. Routine dental floating is a key element in maintaining a healthy horse. Removing sharp points from a horse’s teeth ensures that he is able to chew properly and alleviates oral ulceration. Dentistry can also become important in sport horses; sharp points and hooks can create painful areas which will cause a horse to resist the bit or begin to head toss. An oral examination can be performed to evaluate the need for dental floating in your horse. Starwood Equine is proud to offer a cordless PowerFloat for stall-side dentistry wherever your horse is located. Digital radiography allows for stall-side imaging and diagnosis. Starwood's MyRad60 Digital X-Ray Unit is a top of the line machine capable of producing quality images from the foot up to the stifle and neck. Our cloud-based image database is a convenient way for images to be viewed by clients, veterinary specialists, and quickly shared in the event of a horse's resale. Emergency coverage is available for regular clients, 24 hours a day, seven days a week. We hope you never have an emergency, but take comfort in knowing that we will be there. Starwood Equine offers an extended care program for our clients year round. While traveling have peace of mind in knowing that one of our trained Starwood Equine technicians will be caring for your horse. Technicians will provide clients with daily reports and have open communication with on call Veterinarians if any questions or concerns arise. Extracorporeal Shockwave Therapy (ESWT) is a non-invasive regenerative technology that is used in human and veterinary medicine. It helps the body in relieving pain, speeding healing and improving the quality of healing. It is indicated for a variety of conditions including tendon and ligament injuries, wound healing, bone healing, and degenerative joint disease/osteoarthritis. Gastroscopy involves visualization of the inside of the horse’s upper gastrointestinal tract in order to diagnose equine gastric ulcer syndrome (EGUS). A study shows that gastric ulcers have been found in 2 out of 3 horses in heavier work/competition. The procedure involves using a 3.5 meter flexible video endoscope which allows direct examination of the stomach lining. Our system offers full screen, real-time imaging and allows for storage of full videos and pictures. Starwood Equine is excited to announce that we have purchased a Class IV Laser and now offer Laser Therapy to our clients! Laser therapy is a scientifically-proven safe, noninvasive, and pain-free treatment. It is used to reduce pain and inflammation, and promote faster healing for a variety of conditions from superficial wounds, infections and other acute conditions, to more chronic soft tissue and musculoskeletal conditions. Mesotherapy is a therapeutic modality used to address chronic back and neck pain. Treatment consists of multiple intradermal injections that are used to stimulate the nerve fibers within the dermatomes of the skin. Pain relief is based on the gate control theory of pain. The dermatomes within the skin have collateral nerve fibers that are associated with deeper structures of the same spinal segment. When the skin is stimulated intradermally, there is an inhibitory effect on the conduction of pain ultimately stopping the pain-spasm cycle. Treatment is often performed with saline, however a combination of medications such as a local anesthetic or short acting corticosteroid may be used. This simple and inexpensive procedure is required for all new FEI Passports and all horses showing in USEF sanctioned event, but should not be exclusive to show horses, alone. All clients can benefit from the piece of mind in knowing that their horse has a permanent means of identification. Providing balanced nutrition is necessary for your horse to maintain health and performance levels. A variety of diseases and metabolic disorders have specific nutritional requirements that must be addressed in order to properly treat their condition. ​In some cases, laboratory analysis of feedstuffs is crucial for treating diseases and preventing symptomatic episodes from occurring. A thorough evaluation of general health and soundness is recommended prior to the purchase of your next equine partner. We understand the financial and emotional investment this process requires and is happy to walk you through each step of the way. Starwood Equine provides routine vaccinations and deworming protocols tailored to your horse's needs. Coggin’s tests for Equine Infectious Anemia (EIA), Health Certificates for travel, and Insurance examinations are also available. We are proud to offer tonometry services (intraocular pressure) for quick diagnosis and ongoing monitoring of ocular diseases such as Glaucoma or Uveitis. Ultrasound provides a real time view of the soft tissue structures of the body. Serial imaging of an injured tendon or ligament is utilized during the rehabilitation process to design an appropriate exercise schedule. Cloud-based data storage is also used for ultrasound images.